According to reports, the EF-2 tornado touched down just before 9:30 a.m., affecting an estimated five mile stretch in McCracken County. While the church was severely damaged, the room where the children were gathered was not touched. 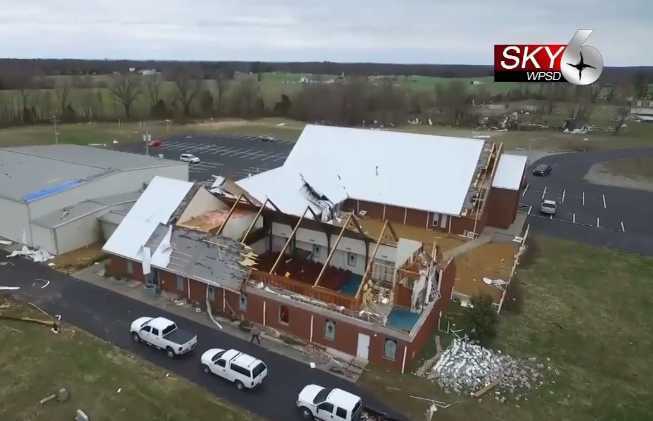 Photographs and video footage show the roof ripped off one wing of the building where the sanctuary was, an airbound piece of the roof lodged into the middle section of the building, and then lesser damage to the roof where the children had been taking shelter. Hanline noted that the nursery was just across the hall from where the children were gathered, and “the roof is gone” there. Video footage shows pieces of the ceiling panels and insulation that had fallen into the nursery beds. Homes across the street from the tornado were also unharmed, although debris from the church blew into their yard. “The almighty hand of God has provided safety to our community,” Sheriff Matt Carter told the West Kentucky Star. Mathis said that the severity of the situation, and the miracle that took place, set in once the twister was over. “I think it didn’t really hit me until about 10 minutes after the tornado, after I left here, what could have happened, and why God was on our side, and why He was even with us moments leading up to the tornado,” she stated. Mt. Zion Baptist Church held its worship services this past Sunday at Family Life and Worship Center, where they reflected on the situation and thanked God for His protection.